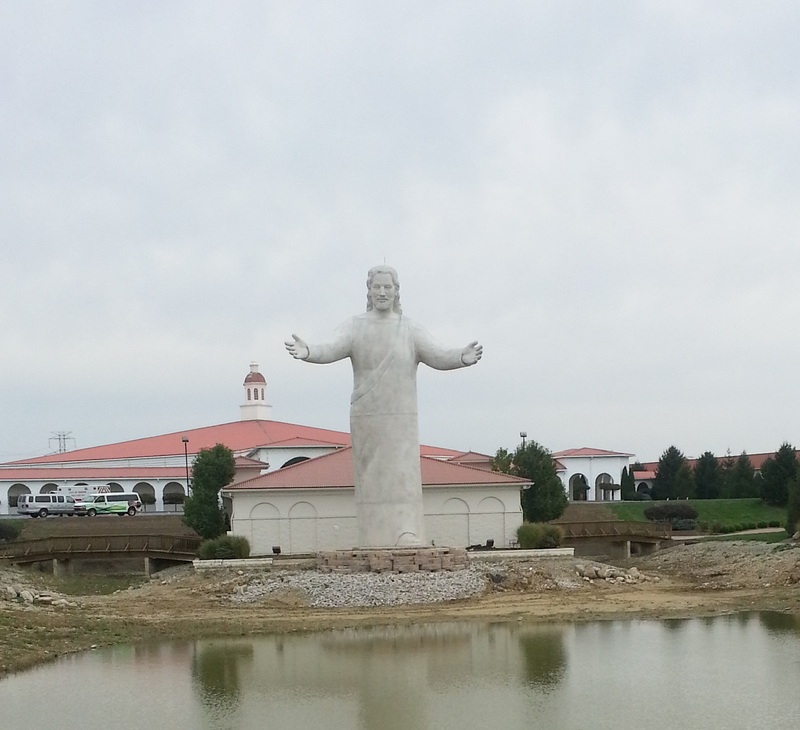 Over two years after Solid Rock Church’s monumental Jesus statue, named “Light of the World” (and dubbed Touchdown Jesus by many), was struck by lightning it was finally replaced on September 20 as previously promised by Pastor Darlene Bishop and her late husband Rev. Lawrence Bishop. On September 30, a congregation of over 3,000 members along with the leaders of Solid Rock Church celebrated the new statue, "Lux Mundi" or Light of the World. 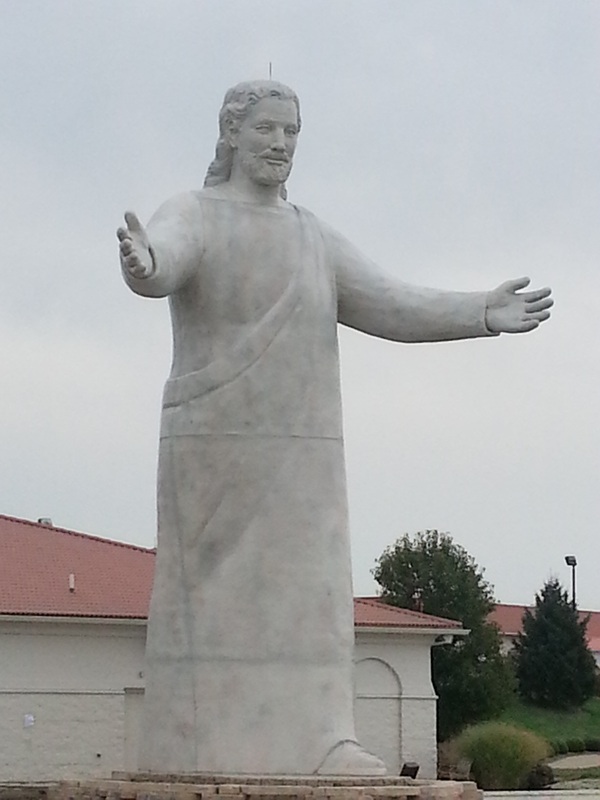 Called “King of Kings,” this 52-foot tall statue is the second largest statue that depicts Jesus in the United States. The statue’s designer Tom Tsuchiya received a standing ovation from the congregation for his creation on Sunday. "It turned out exactly the way I wanted," said Tom Tsuchiya, whose original life-sized design was translated into a 30,000 pound statue. A fire retardant material was used this time as the statue was carved in polystyrene, which is the same type of material that’s used in buildings, by Global Manufacturing Solutions out of Dayton, Ohio. The sculpture was then dry-fitted, painted to resemble stone and coated with polyurea by Display Dynamics in Englewood. The previous statue was funded through donation by the members of the church and cost approximately $250,000. Insurance money from the fire was used to purchase the new statue, and an agreement between the sculptor and Solid Rock prohibits them from disclosing the exact cost of the monument. Like the first statue, the construction of a larger than life monument of Jesus can cause a bit of controversy. A small minority of people call the statue a “graven image” to quote the second commandment in the Bible. Pastors Darlene and Lawrence Bishop II dispute these claims saying that the statue is not an object of worship; it is merely a “lighthouse” for all of the travelers who will see the monument from I-75. A memorial service for the late Pastor Lawrence Bishop Sr. was also a part of the service on September 30, as it marked the one year anniversary of his passing.